Infernal Toads are small, pseudo-demons. They are formed from the mingling of impure demonic blood with native Hellish wildlife. Such creatures often spontaneously generate in the aftermath of Hell's never ending battles. 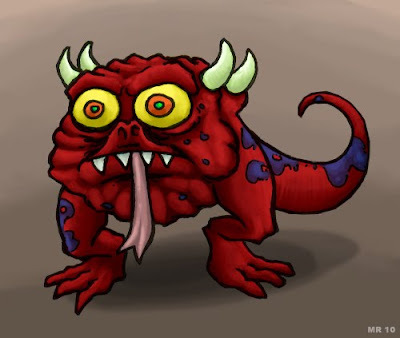 Over hundreds of years Infernal toads may "evolve" into higher demon forms. 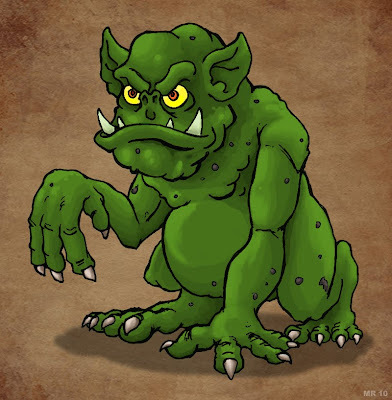 Hobgoblins originated in European folklore as household spirits (which probably evolved from a form of ancient ancestor worship,) and played a similar role to goblins, brownies, pixies, etc. They were generally not seen as "evil," but would play tricks if not given the proper respect. 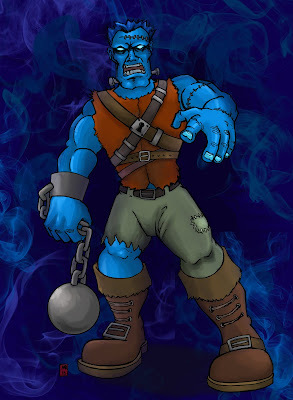 In modern fantasy fiction, Hobgoblins are a larger, stronger, brutish form of goblin. They are usually a greenish color, have features of various animals (claws, pig noses, etc.) and are mostly beholden to some figure of greater evil. 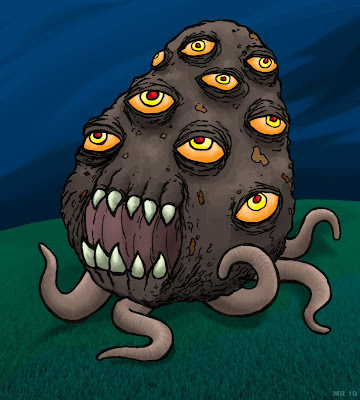 A strange crossbreed of Potato and Octopus, the Potatopus roams the countryside, feeding on those who cross it's path. 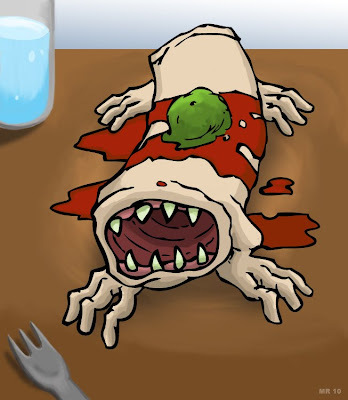 It's dense, fleshy body is able to adequately absorb bullet impacts without harm, although the creature is highly vulnerable to microwave radiation. This is what happens when you don't cook your food all the way through. 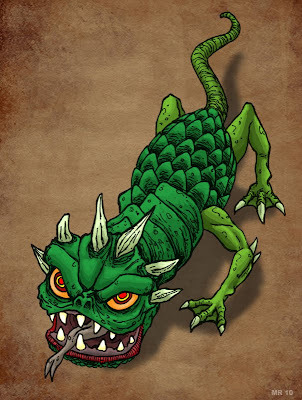 The Micicwurm is a type of small dragon. This particular breed is known for it's incredible ability to mimic human speech. The beast will often use this talent to set up ambushes, often crying out for help in the voice of a small child, then preying on the would-be rescuers. Disgusting scavengers which infest the lower levels of Hell. 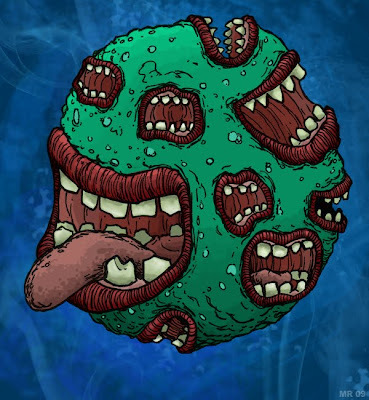 Filth runners are the mutated remains of souls who have been mutilated after untold centuries. They exist in a mental fog, their twisted, horny bodies scurrying about, feeding on carrion and waste like vermin. Gulf Trippers are enigmatic aliens who transverse the vast tracts of emptiness between stars. They are extremely long lived (in the millions of years range,) able to withstand the fierce cold and airless void of open space, and feed themselves by harvesting stray gasses and the solar winds. Gulf Trippers are quite intelligent, and have picked up a large amount of information about the various star systems they have traveled to and the alien species which inhabit them. 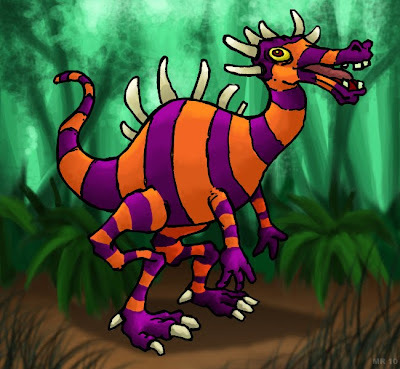 The Crookedsaurus is a relic dinosaur population, aptly named becasue of it's unique three jointed lower legs. The extra joints give the creature unbelievably fast maneuverability through tall jungle foliage. The ghoulishly strong monster created by a mad scientist in 1818, the Frankenstien's monster was never given a name in the official narrative. 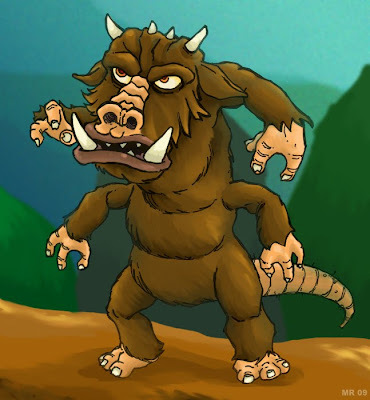 The creature is not described much beyond being large, ugly, and ogreish. The process by which he is created is not described in detail either, although it is hinted that various raw materials (including body parts) are included. Much of what has become the modern version of the monster (i.e. the flat head, prominent brow ridge, bolts in the neck, zombie-like locomotion, largely inarticulate groaning, green skin, etc) comes from the 1931 Universal film. 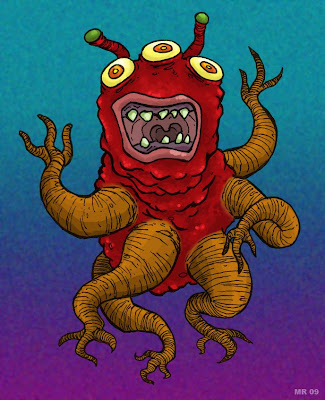 Soul Maggots are damned souls reincarnated into overly large, rubbery grub-like bodies. They are slow, clumsy, and helpless, the soul within having only a vague control of it's fleshy form. Minor demons keep them as cattle, harvesting their flesh and blubber for food purposes. Such harvests leave the Soul Maggots debilitated and in pain, until the harvested regions grow back and the cycle begins anew. 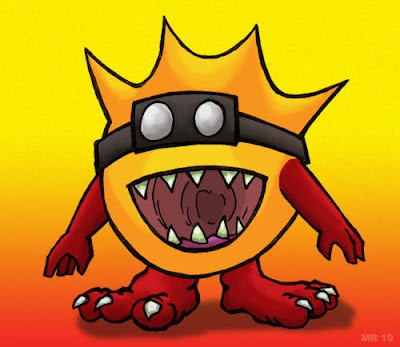 Mawstingers are viscous subterranean predators. 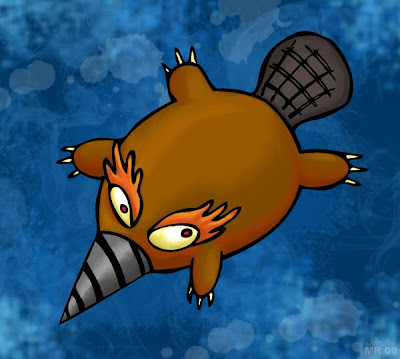 They generally inhabit underground rivers and pools within deep caves, but are also able to move quite quickly over land. The stinger at the end of the tail contains a fast acting venom akin to a scorpions, which is designed to immobilize the target. 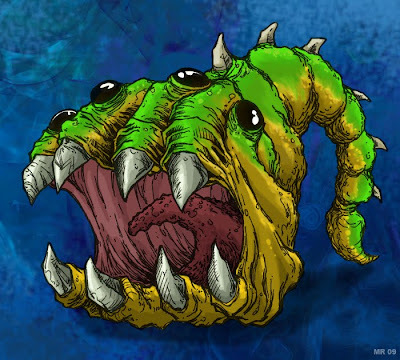 The creature's mouth then balloons to three times it's normal size to swallow the prey whole. 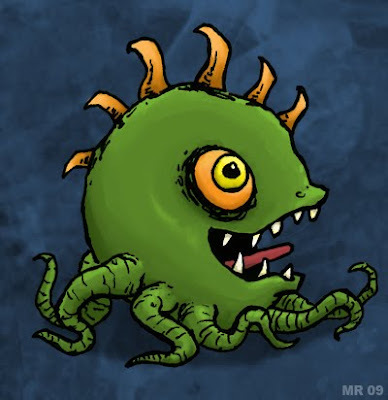 A weird combination of vegetable and bodypart, the Skullmato is a unique creation. The original owner of the skull in question lead a violent, treacherous life, with dozens of victims in his wake. 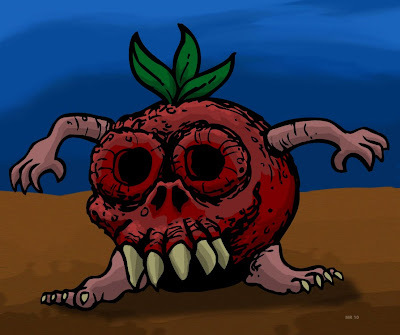 After his execution at the hands of the inquisitors, his skull was used in various magic rituals, and was eventually mystically bonded with a tomato. The resulting mindless creature knows only the will of it's master. 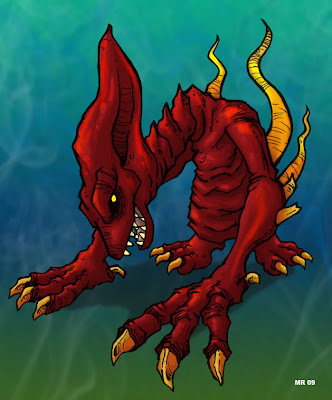 The Twisted Ones are a clan of imps which have escaped from servitude and have gone "wild." Thousands of years in Hell's oppressive wilderness have warped these creatures into mindless eating machines, which other demons consider little more than vermin. While the development and population of normal Imps are held in check by more powerful demons, these Imps have no such constraints. Every once in a while the conditions will be just right, and the Twisted Ones will suddenly multiply by the millions and swarm over Hell's cities. During such times the multiple factions which are constantly warring for control of Hell will bring a momentary truce to the conflict to suppress the Twisted Ones and exterminate them. Nesolians are bipedal, six limbed humanoids with insectoid characteristics. Due to the low gravity on their planet, they posses a slight frame and thin bone structure. The Nesolians at one time possessed a planetwide culture with advanced technology, but nearly destroyed themselves in a series of devastating wars. Although centuries have passed their planet is still recovering from the ecological effects of these wars. The few remaining Nesolians are pacifistic in nature, and tend to hide themselves from outsiders. The creatures known as "Octaballs" were created centuries ago by a young wizard as a practical joke. 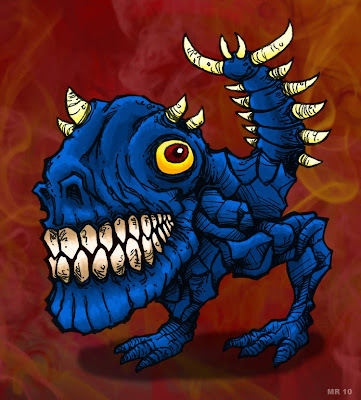 The essence of a horned lizard was combined with several other slimy things to produce the first of these horrid monstrosities. The first Octaballs were small and harmless, but as they fed they eventually grew and became quite dangerous. 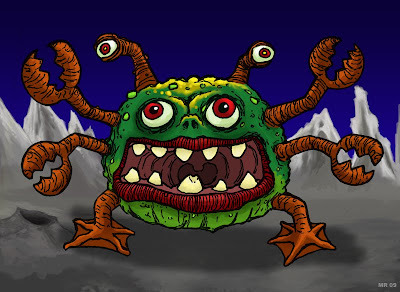 Although an extensive campaign was waged to eliminate these aberrations, sporadic reports of the creature still surface in deep caverns or forgotten dungeons. 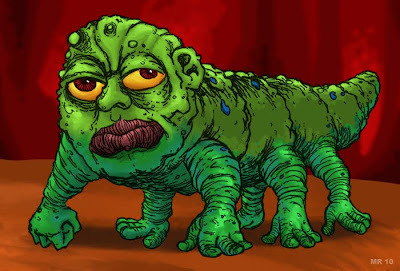 The QuasiRippers are a race of predatory aliens from another dimension. Due to a scientific experiment gone awry on their side, a large number of them have become trapped inbetween dimensions. Because of this unique quantum state of being, they are not held bound by the laws of physics, and are capable of extraordinary feats - such as walking through walls, disappearing, floating through the air, etc. This unique quantum state also makes them invulnerable to normal weaponry, although electricity and several forms of radiation can disrupt their molecular cohesion. Burrito Monkey started his life as a common spider monkey in the San Diego zoo. 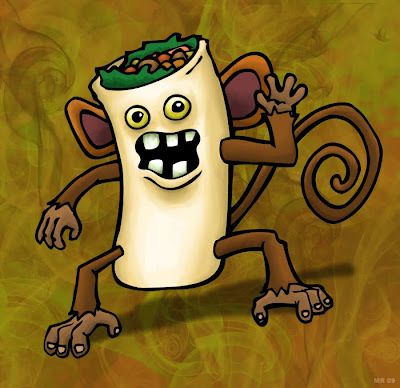 A one-in-a-million accident involving a toxic waste spill and a microwave burrito mutated him into his present form. Imbued with superior strength, agility, and intelligence (for a monkey,) Burrito Monkey now protects the citizens of San Diego. In addition to fighting crime he's also a staunch environmentalist and animal rights activist. He also sees nothing wrong with eating burritos, despite being one himself. Babbler Orbs are strange entities from other dimensions. For unexplained reasons they can "pop" into our reality for short periods of time. The physiology of a Babbler Orb does not seem to conform to the laws of physics, for instance besides floating in the air, the creature has no sight or hearing organs but is able to observe it's environment, and each "throat" for all of the multiple mouths seem connected a completely different set of internal organs. They are also able to maintain separate conversations with multiple partners at once, although it is possible to get the undivided attention of all of the "mouths." Helicalites are small bipedal creatures specially adapted to live in extremely hot environments. They have been known to withstand or even enjoy extreme temperatures of 500 °C or more. Due to this unique ability many Helicalites tend to find work as metalworkers, smelters, geothermal power plant operators, and so on. 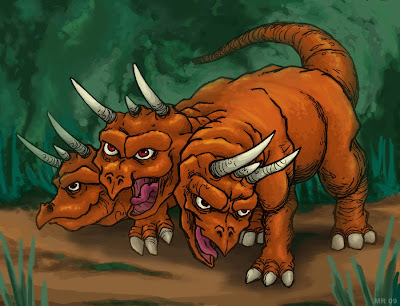 A Ceratopian dinosaur with three heads. The Triasaurus lives in deep jungles Africa, where local tribes revere it as a God. Legends of the creature go back at least 1000 years. In the 1850s several expeditions were lead to hunt the monster down, as it was blamed for extensive livestock losses in the area. Witnesses describe bullets bouncing off the creature's thick hide. Modern reports have become increasingly sporadic, leading some to speculate it has gone extinct. Scaphalites are strange alien creatures which have adapted to life in the vacuum of space. It is believed that within their bodies are special organs which transform various inert gasses along with starlight into oxygen, similar to photosynthesis in plants. They make their homes in small villages on and within large asteroids in territories unclaimed by any galactic powers. There exists in certain solar systems ruins of vast cities and temple complexes which have long since been abandoned. The Scaphalites of today have various legends about cataclysms in the past which have driven them from their ancestral homes. 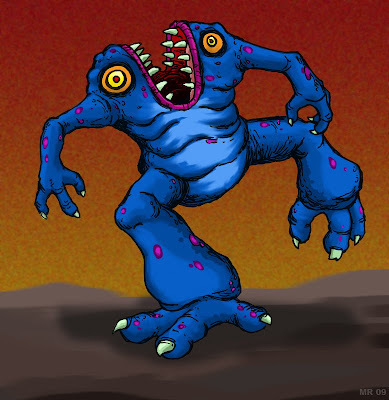 Gugalites are bizarre subterranean dwellers, that live in deep caverns miles below the surface of the Earth. Despite their strange appearance they are quite intelligent, and have been known to maintain fish populations in vast underground lakes and to grow certain types of phosphorescent algae as a food and light source. There have been several incidents of deep oil well drillers encroaching upon their settlements, of which the Gugalites consider a hostile encroachment upon their territory. 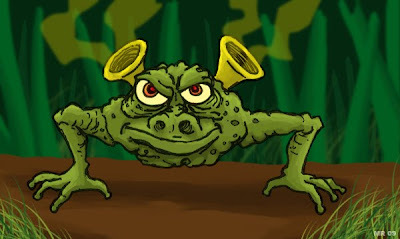 The Bufo Smellahollic, better known as the "Stink Frog," large species of highly specialized frogs. 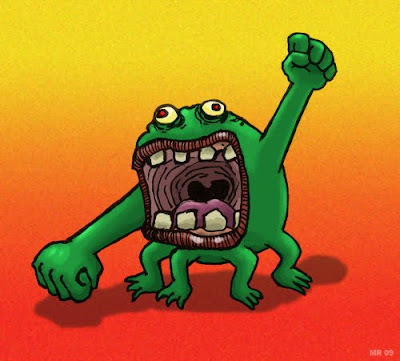 The prevailing theory is that they are evolved from a mixture of rare amazon poison frogs which were bought as pets but escaped into the sewer systems of large cities. The forelimbs of the creature have tripled in size and are used for a bowlegged form of locomotion while the hind legs have all but disappeared. The ears are no longer merely instruments for hearing, but have evolved into strange, cone-like protuberances that secrete an odorous funk, used to mark territory and as a defensive measure. The Celestial Warlocks are an ancient secretive sect. They are primarily made up of the Trimirapoid race, but will accept students of worth from all races. The sect lives in a secret, agrarian lifestyle, in stark contrast to the high technology possessed by it's member races. The stated aim of the Celestial Warlocks are to maintain balance and order in the universe between dark forces and dimensions. However they are generally shunned and feared due to their strange powers and secretive nature. It's legs go great with a little butter and BBQ sauce. 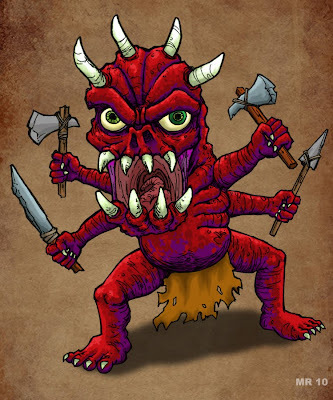 The Sabascatcth is a lonely four armed brute which haunts forests looking for stray children. If he should happen to catch one, he'll keep it around as a companion for a little while, until his hunger overwhelms his desire for companionship. They are extremely stupid, and have been known to fall for the simplest tricks.